Fenton Family Dealerships uses a technology to provide virtual walkarounds and 3-D interior tours on its vehicle detail pages. When Bob Swartz is shopping for hotel rooms, he likes having the option of taking virtual tours, where he can look around the room he's considering and see the view. That capability inspired him to try it on cars, too. 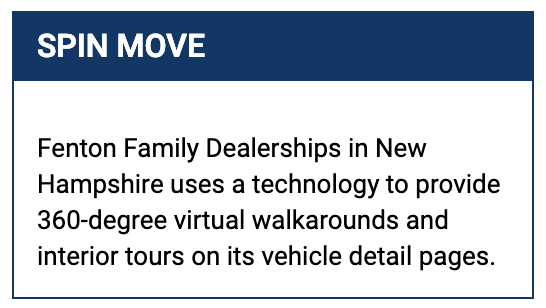 So Swartz enlisted SpinCar, a company with technology that allows dealerships to build virtual, 360-degree vehicle walkarounds to bolster their vehicle detail pages instead of relying on photos only. 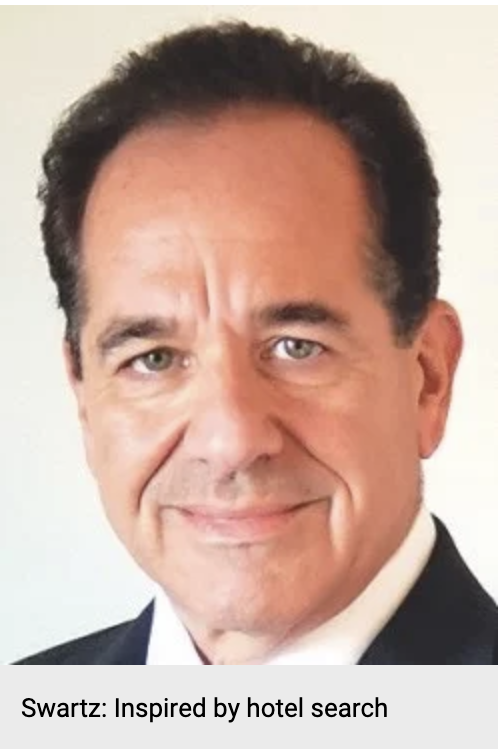 Swartz, CEO of Fenton Family Dealerships in East Swanzey, N.H., piloted the walkarounds at Toyota of Keene in East Swanzey several years ago before it was adopted by the group's other dealerships, which sell Honda, Hyundai, Subaru and Volvo. A quick perusal of Fenton Family sites shows vehicle pages where consumers can get 360-degree views of exteriors and interiors, which include clickable icons on different areas to explain features and provide closer views. 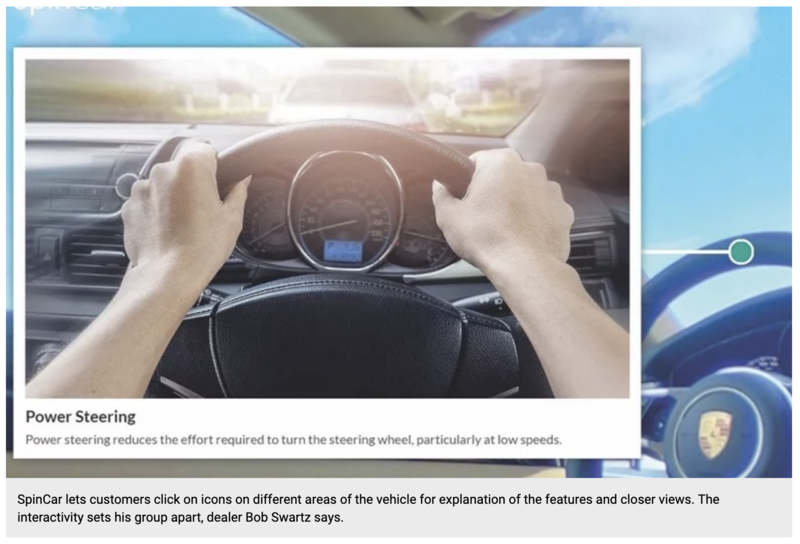 A click on the hood's icon, for example, shows potential customers what the engine looks like, while tapping the icon near the brakes of a Honda Civic will bring up a quick explainer of that model's four-wheel disc brake setup. The SpinCar walkarounds can be accessed through desktop computers or mobile devices. With the mobile view, customers can spin the vehicle and check out the interior using their finger, or by moving the phone around. Desktop shoppers can navigate with a mouse. Swartz said the level of interactivity has set the Fenton stores apart from competitors that still fill their detail pages with static photos. For online shoppers, it's one step closer to experiencing the car in person. "We've had shoppers who said they were shopping on other sites that didn't have this feature," Swartz said, "and they recommended friends and family to go to our site that had this feature so they could look through the car and take a really good look." SpinCar, complementing its vehicle walkaround tool, has added another layer to vehicle detail pages that replaces long feature lists with what it calls Feature Tour. The tour function allows shoppers to select features they're interested in learning about from categories such as safety and performance on the detail page. The system then highlights the most relevant features and options with descriptions of systems such as blind-spot monitor, lane-departure warning or adaptive cruise control. Video can be worked into the tours as well. The goal is to keep shoppers on sites longer and reduce their need to go to another site for further research. The Feature Tour, introduced at the NADA Show in January, came about when a luxury automaker approached the company after finding a problem: The automaker had introduced a front-end lift system, which raises the front of low-riding models for extra clearance, but online shoppers didn't know what it did. "People would come across that feature on the website, and they would bounce from the website because they had no idea what it was, and they would end up Googling the feature to figure out what it was," said Devin Daly, SpinCar's CEO. "This manufacturer came to us and said, 'Is there any way we can use your technology to embed more explainer content?' "
Swartz believes the Feature Tour has led to more educated consumers who don't haggle as much when they come to the dealerships. And online shoppers are sticking around the site for extended periods — 31 minutes in one case — exploring the features. "The consumers are coming in more knowledgeable about our vehicle," Swartz said. "They can see the condition of the car better. The feedback is that they feel more comfortable taking a longer drive to come see a car than they did when we were just putting up static pictures."